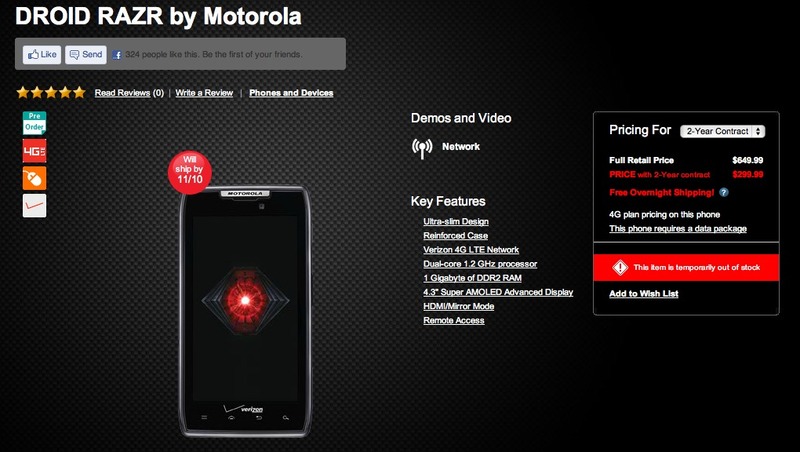 After having been available for the pre-order for only a few hours, the DROID RAZR appears to have sold out online. I actually can’t remember the last time I saw that happen with an Android device. Could just be that Moto and Verizon limited the supply to get suckers like me to write this post or maybe it actually did sell like hot cakes. Definitely a top tier phone, so I wouldn’t be surprised if people did jump all over it. Oh, and if you upgrade a device or add a new line, you can actually get it for $249. Update: And it’s back. Available again. Cheers @mhamann, Brandon and Jerry!